At the start of 2003, Tony Blair was Prime Minister and was yet to have his Iraq problem, Girls Aloud had the No 1 single, London had no congestion charge, and Geotechnical & Environmental Associates (GEA) Limited started trading. GEA is now 25-strong with a turnover of over £3.5M. The company is a well-respected and well-known geotechnical and contaminated land consultant, and ground investigation specialist, with a fee income that places it in the top 20 in the UK. It seems now a long way from our beginnings in January 2003, but the story of GEA has largely been one of gradual growth on the basis of earned income. I started the company after leaving my role as Managing Director of LBH Wembley, and set up in a small serviced office in a converted old school in London Colney, Herts. Our first office space was about 500 sq ft, for which we paid around £500 per month. I had a limited amount of capital, but soon discovered that a new company with no credit history doesn’t find credit easy to come by and the capital soon disappeared. We were fortunate on a number of counts. One was the relative flexibility of business banks in 2003 (much has changed!) and, on the basis of my track record of running a similar firm, we were able to obtain invoice financing, whereby the bank would immediately pay us a proportion of each invoice that we raised. This enabled us to bridge the inevitable cashflow gap, as drillers and labs would require payment some weeks before we would be paid in the normal way. (The bank’s generosity was of course not unbounded, and my family home was put up as security against the loans). Secondly, I was setting up the firm just as computing and networks were becoming more powerful, which meant that we were able to set up databases for all of the company’s systems which have stood us in good stead for 15 years. I was able to start the firm with a good base of contacts and clients from my time in the industry, and most importantly I was soon joined by a number of LBH Wembley’s former staff. Penny Piddington joined as Company Secretary, bringing her invaluable accounts experience, Juliet Fuller (née Hart) who had been with LBH since graduating in 1999, brought knowledge, experience, enthusiasm and client contacts, and Mike Plimmer, our contaminated land specialist, joined us to be based in Notts with all of his very considerable and unique expertise. By the end of 2003, we had achieved sales of £700,000 and had a staff of five, with Mike Plimmer single-handedly being our Notts office. In June 2004 we moved to a larger space in the same building, renting around 800 sq ft, which seemed palatial at the time, and allowed us to bring in new staff. One of our most significant new recruits was Martin Cooper, who Mike and I had worked with a number of years previously when he spent six months with Wembley Labs as part of his training towards Chartered Engineer status with Cementation Piling (now Skanska). Martin had subsequently completed his training, spent 15 years in piling and ground engineering and, with fond memories of his six months of site investigation, was looking for a new challenge. He was exactly what we needed to complement our existing skills, as his practical design knowledge perfectly dovetailed with our ground investigation and consultancy skills. We had sales of over £1m in 2004, and up to 2008 we enjoyed year on year growth of around 25% to 30%, and as our numbers grew we again moved offices, to a larger space at Tyttenhanger House, a grand former mansion on the outskirts of St Albans. In 2007 the crash hit us, which resulted in our bank withdrawing our invoice finance facility, leaving us with a large cashflow black hole at a time of depleted revenues. Luckily our suppliers were very supportive, we all tightened our belts and our exceptional staff agreed to move to a four-day week for a short time while we weathered the worst of it. From 2007 to 2008 our sales drifted a little, falling around 15% as we continued to work on projects that had already started, but with a shortage of new work we suffered a fall in sales of 35% in 2009, before steadying in 2010. 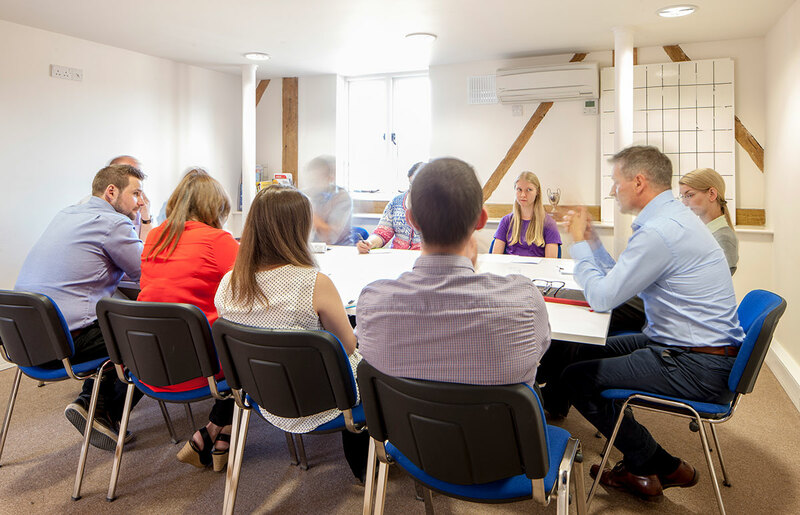 Our sales have since recovered to be almost three times what they were in 2010, and we are enjoying having our own self-contained office – a converted Grade II listed 17th Century barn on the outskirts of Ware in the Hertfordshire countryside. The nature of our work has changed over the years, moving from essentially a ground investigation contractor – although we have always subcontracted most of the field work and all of the lab testing – that carried out consultancy work, to being a geotechnical and contaminated land specialist contactor and consultant. We are working on much larger projects, including a number of high-rise London towers, continue to be recognised as a highly skilled contaminated land specialist and have in particular developed a significant role in the basement development market. It was probably basements that kept us afloat through the crash more than anything else. We developed a specialism in this area very early on, probably before there was any real guidance from the councils in the way that there is now. I lived in Highgate in North London when I started GEA and I have always felt that I have won work by being local to new sites; I think with private clients in particular it gives confidence when the initial enquiry is dealt with by someone that knows where your site is, can discuss the geology and other issues instantly and refer to other similar projects nearby. For some time we worked with Camden as one of their independent assessors looking at planning submissions on their behalf and it has been fascinating to view applications from both sides. So, what have we learned in 15 years at GEA? Although we are of course bigger, have more staff and are well-known, our pipeline of work is not really much longer than it was when we started. So the first thing you learn is not to worry too much! Do a good job and the work will come in is all you can hope for. We do marketing of course, but the best marketing is providing a good service, which leads to recommendations and repeat business, where most of our work comes from. I have also learned that the most important aspect of a business is its staff. We have had one or two recruits that haven’t fitted, but on the whole we have been very lucky with our staff and have very low turnover. Matt Penfold, Principal Engineer, joined us in 2005 for example and is now running some of our most complex analysis projects, Bryan O’Gorman has worked with us since 2004 and has amassed a huge range of contaminated land experience, Susan Connor who looks after plant bookings and report issuing has been with us since 2004 and Matt Legg, currently studying part-time for a masters, has been with GEA since 2007. Happy staff are enthusiastic staff, and enthusiastic people are more fun for clients to work with, are prepared to go the extra mile when necessary and overall provide a better service. Hopefully virtue has its own rewards, as the better service should provide better revenues, allowing the staff to be better rewarded. It will be interesting to see what the next 15 years brings. A very good structural engineer friend is convinced that within a few years much of what we all do could potentially be replaced by Artificial Intelligence, so hopefully the robot in my chair will write better (and more frequent) blogs.